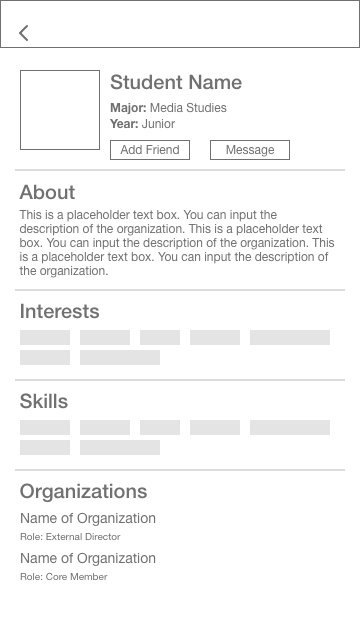 MyOrg is an app designed for college students to find and join on-campus organizations of their interests. The app aims to address the information barrier between students and organizations that exists due to a variety of reasons later discussed in the research section. 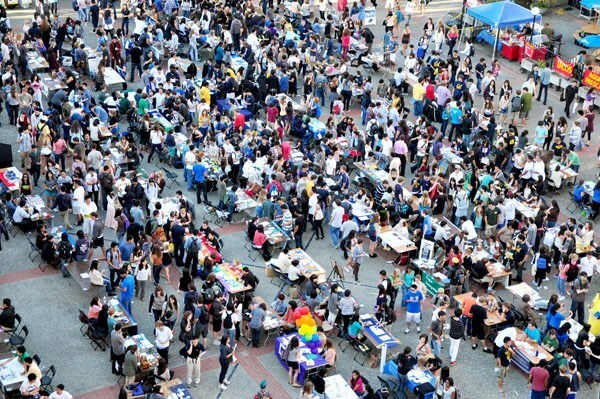 The goal of the application is to foster easier and more personal communication between new students and various student organizations as they search for their new homes in college. To better understand the process of joining campus organizations as new students, I interviewed 5 college students about their experiences, who came from diverse backgrounds with different interests and goals. Through interviews, I aimed to understand more about students’ past experiences with searching for student groups and to probe into their emotions behind the process. In addition to the interviews, I also created a survey that asks about students’ needs and concerns regarding the organizations that they want to apply for, especially the criteria that they value the most when learning about organizations. Besides the experience of searching and browsing, I also asked about the experience on the other half of the spectrum, which involves the experience of promoting and recruiting for a student organization. One of my interviewees, Fred, told me about his experience rushing for a fraternity. He said that he rushed “because it was cool”, but as an international student, he did not have much prior knowledge about Greek life. So after joining the fraternity, he found the experience quite different from what he expected. He wished that there could have been more introduction and informative background culture provided to him. Caroline shared about her experience when she was a freshman in college. She didn’t know where her interest lied exactly, so she talked with her friends. She thinks that friends are a big factor for new students to determine which organizations to join. Several interviewees mentioned that finding a sense of belonging and meeting new people was a strong motivation for them to join student groups as new students. New college students might experience a variety of emotions that need to be taken into consideration of the design decisions. The uncertainty about their competence, interests, the curiosity about opportunities, and the need for a sense of belonging and new social connections are all important factors that can be incorporated to optimize their experiences joining student groups. While ideally, students gain a quite holistic understanding of the student group before they join, based on what I learned from the interviews and survey results, it is not always the case; various barriers exist between student applicants and recruiters, leading to miscommunication and even missing opportunities. More personal conversations between the student and existing members of the organization can help to reduce the barriers by addressing the specific questions and concerns that the student might have in a more direct and convenient way. Having a centralized platform to organize important dates and events regarding student organizations can help the student better make decisions. how might we reduce the information barriers between organizations and students? how might we allow students to better establish more personal connections with different campus groups? The synthesis highlights a trend that friends and info sessions are two biggest influencers for students’ decisions. Therefore, I decided to move forward with incorporating the advantages of these two approaches, which are personal conversations and trust from the former, and great access to information from the latter, while minimizing the pain points listed above. 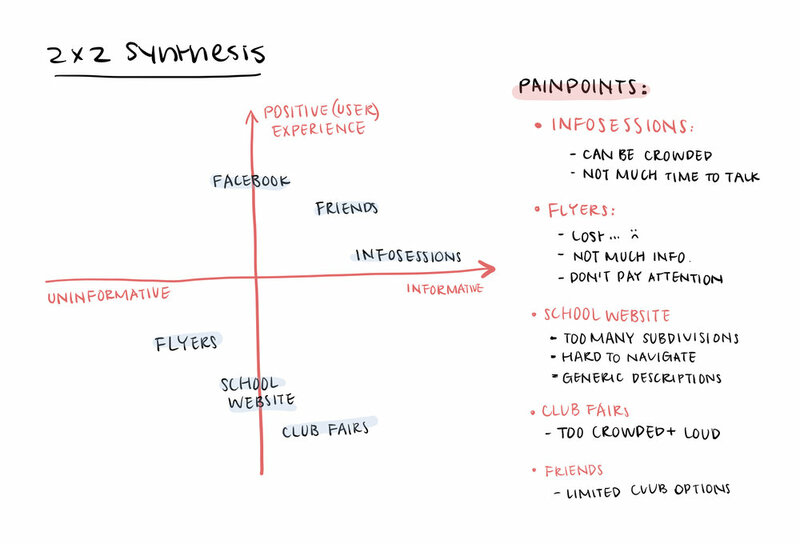 In order to better understand users’ needs and frustrations, I created two personas for both students seeking to join a club and students recruiting for a club, who are the two key players in the process of club recruitment. The goal is to provide a centralized place to remind users of important events and dates they saved and keep posted with the organizations that they are interested in. Users can search for organizations by key words or browse by categories. The “Recommended for you” section displays organizations that match the user’s one or more interest tags in the profile. It helps students, especially new students, to discover and match with clubs more quickly and reduce the possibility of missing opportunities. The user can find the detailed description and events of the organization on its profile page. If interested, the user can choose to follow the organization to keep updated with future announcements or to message them with any questions, concerns, or just a simple self-introduction. Student users also set up their own profile. The tags in the interests and skills section help organizations identify and reach out to the student if they found the student a potential good match with the group. 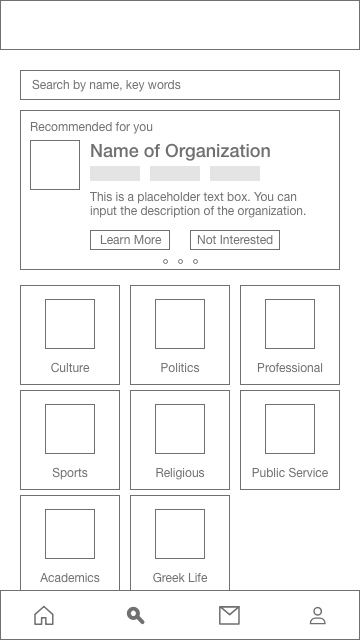 Students can also add themselves to any organizations they already joined, and their profiles will subsequently be listed in the “Members” section of the organization, but only if they want to. 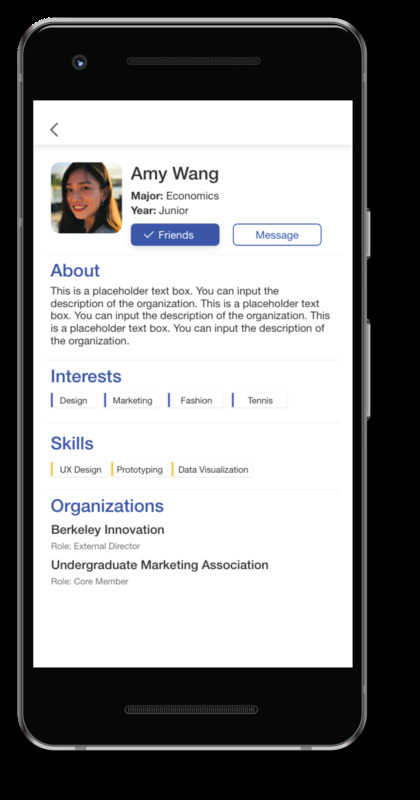 In the mean time, users can view the profile of other students, who can be their friends or the members of the organization that they are interested in. They have the opportunity to also directly message the person to have more in-depth but personalized conversations about the club. Users can directly message organizations with any questions, concerns, or just a simple self-introduction. They can also reach out to members of the organization if they want more to hear more personal insights and experiences. In the meantime, the chat function also allows the recruiting team of clubs to actively reach out to students that they think are potentially good fit for their clubs, thereby encouraging more proactive communications from both sides. The task at first was quite broad and open to investigation — exploring student groups is a dynamic process and can even be a little hectic sometimes, and there is definitely a lot to be improved in the process. After learning about experiences from different students, I discovered an opportunity space where students can be better connected to on-campus organizations and conversations with more personal storytelling can be encouraged. Hence, I want to create this channel for both students and clubs to find their right fit. Because of the time given, I only had the opportunity to investigate more from the student’s point of view. If more time were given, I hope to learn more about the recruiting experiences of clubs and establish a more systematic and effective way for them to also reach out to students on the platform. I would also want to conduct interviews with a wider range of students that are of different class standings and backgrounds to make sure that my design decisions address their needs.